Leopard Sharks, Triakis semifasciata. For The Home Aquarium? Blame it on the genre of films like Peter Benchley's "Jaws", some pre-disposing basal fear-response of humans to toothy perceived predators, a morbid fascination with wanting to witness meat-eaters in action... even a western notion of control of dangerous elements of the living world... many folks are just outright mesmerized with sharks, shark-keeping included. A perfunctory look-about on the Internet will show that other than a few families of small, largely sessile tropical sharks (Bamboo, Epaulette, Cat...), most of the 350 or so species of selachians are poor candidates for aquarium use. The vast majority get way too big, and even relatively small individuals, species require large volumes of water, tanks with rounded corners to accommodate their body movements (they can't make sharp turns). What's more, the majority of "other" sharks offered in the trade are decidedly cool to outright coldwater organisms... requiring the use of a chiller/chilling mechanism for their water to enjoy a healthy life. Public aquariums, with trained staffs, large aquariums, often ready coldwater are able to maintain these types of sharks for near their normal lifespans (decades), but almost no hobbyist does so... with their sharks dying "mysteriously" after short times in captivity if not jumping out of inappropriate systems. How big does it get? About six feet in length overall, though not commonly seen at more than five... and is/can be a slow grower (lives for more than thirty years in the wild)... with one foot or so juveniles growing as little as an inch or two per year for the first few years. All sharks need ROOM... to move, grow, dilute their wastes, allow for gaseous diffusion of gasses for respiration... Not hundreds, but several hundred to thousands of gallons in the case of Triakis... Tanks of less than ten feet in length, five in diameter are equivalent to you or I being confined (permanently) to a closet... behaviorally, physiologically and psychologically prohibitive. The road to heck is paved with good intentions or so it's said, but thinking that you'll "get a bigger system" when your shark/s grow larger is worse than wishful thinking... it's outright cruel. Let me repeat this point in a different way to emphasize my intent: IF you don't have a tank at least ten by five feet DON'T try keeping even juveniles of this species. On the plus size cost, maintenance and operation wise, the height of the system is of less functional importance... so yes, you can keep such sharks in round, rectangular "swimming pools" of a depth of two, three feet. Filtration, circulation, aeration are critical elements of the care of sharks, the Leopard inclusive. For animals that "store" a good deal of nitrogenous waste in their bloodstream (the rationale often offered: to establish osmotic barrier to salt in their environment), sharks are intolerant of accumulation of same in their captive systems. NO detectable ammonia, nitrite OR nitrate is the goal you want to prepare for and achieve. Simple wet-dry filtration, ammonia towers, fluidized beds... will NOT do... chemical and/or biological scrubbers, extensive live sumps (refugiums), deep sand beds (DSBs)... and the like... of SIZE, capacity are required (unless you have access to clean seawater...) to maintain these fishes. Circulation and aeration need to be brisk, the water kept in motion for exercise, filtration purposes, and dissolved oxygen near saturation (about or greater than 7 ppm). Water chemistry otherwise is not quite as demanding for Leopards as for other commonly kept sharks... the species is often found in muddy harbors and bays... even venturing into brackish settings. A pH near 8.2, near seawater specific gravity is recommended however. Temperature needs to be kept cool to cold... these animals live in settings that rarely approach 70 F.... somewhere in the 50's to mid 60's is ideal. Folks next to natural seawater sources may be most fortunate to be able to pump up the real thing on incoming tides... others can afford heat-sinks, exchangers with perhaps cold-ground to save money... but most all will need to look into and invest (up front for purchase and ongoing for electrical) a serious chilling mechanism. Decor should be sparing if the system is not absolutely huge. This shark spends most of its time setting on the bottom, but a good deal also cruising about. Bottom can be sand (not sharp or silica-based), or rounded rock. Some artificial kelp lends a nice look as well as a calming influence... discounting, though not eliminating the chance of jumping! 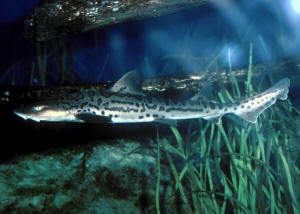 Triakis semifasciata Girard 1855, the Leopard Shark. Eastern Pacific, California to Oregon. To about six feet in length. One of the familiar "aquarium" sharks... that is NOT A TROPICAL FISH! Shown, a common individual and a pleasant variant of marking, but no better for warm water use. Healthy Leopard Shark specimens are clear of scratches, cuts and bloody markings (look particularly at the mouth and fin insertions)... Their eyes are clear, observant, respiration/gill movements not labored or rapid (20-30 per minute is about right). Newly arrived specimens should NOT be purchased, as many of these perish within a few days to a week from shipping, collection, handling damage and stress. This shark is ovoviviparous, in plain terms, they utilize internal fertilization, with young developing within females but without a nutritive ("placental") connection... Small individuals are sometimes collected by extraction for the aquarium trade. Avoid individuals under a foot in length to assure missing these as well as securing specimens having good chance of adapting to captive conditions. In the wild, Triakis feeds on a wide mix of invertebrates (crabs, clams, worms) and small fishes. In captivity, they are similarly non-catholic in their diets. Institutions add capsules of vitamins, amino acids and iodide in the body cavities of food items... a practice that home hobbyists should emulate. So, you've looked over the "recommended" families, species of smaller-sized tropical sharks and they're just not "sharky" enough for you? And you think a cheaper Leopard shark will do... than the more expensive Blacktip at the store, online? This is not the case. Triakis semifasciata needs as large a system, AND an expensive to buy and operate chiller to boot. Sharks are just not for most everyone, and you would do better to visit them in public aquariums, in recorded media, and as I do, in occasional underwater encounters out diving and snorkeling. Fenner, Robert. 1996. A Diversity of Aquatic Life. Shark Attack! TFH 5/96. Michael, Scott. 1999. Just say no! (in ref. to smooth hound sharks). AFM 12/99. Michael, Scott. 2001. Aquarium Sharks & Rays. An Essential Guide to Their Selection, Keeping and Natural History. Microcosm/TFH New Jersey. 256pp. Nelson, Joseph S. 1994. Fishes of The World. 3rd Ed. John Wiley & Sons, NY & the World. Roth, Allan. 1986. 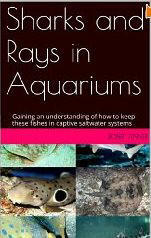 Sharks: Recent Advances in Captive Biology. FAMA, 5/86. Scopes, Jack. 1994. Keeping Sharks: What You Need To Know. FAMA 12/94. Stevens, Jane E. 1995. The delicate art of shark keeping. Sea Frontiers, Spring 95.